All Ways Painting is proud of the quality and satisfaction we deliver to our customers. We are honored to share with you some of the projects we have been fortunate to be a part of and, are very thankful for being given the opportunity to paint several notable buildings. We would like to share with you some of our ventures. 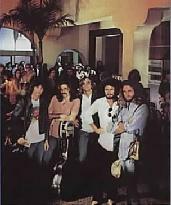 The Lido Building: This building was used for photos of The Eagles that appears in their Hotel California album. Other photos are to give you an idea of the vast versatality that our crew and our company is capable of providing. We have taken some buildings to new heights! We have even painted the Unusual!